A couple places I’ll be. Staircase Sectionals is an exhibit of found-object metal-assemblage work. After the show ends on Jan. 15, the panels will be installed on a metal stair that provides access to community development corporation, Southeast Neighborhood Development’s (SEND) roof. Lord of the Yum Yum and other experimental sound artists will perform starting at 9 p.m.
Chicago hosts a one-day-only pop-up bookshop featuring the best of the Midwest’s independent presses, bookstores, and magazines. They’ll be plenty of book shopping (just in time for the holidays) as well as sporadic performances, all at the Green Lantern Gallery, originally meant to be the home for the new bookstore The Paper Cave. Instead, we’ve condensed the bookstore into a one-day booktravaganza. 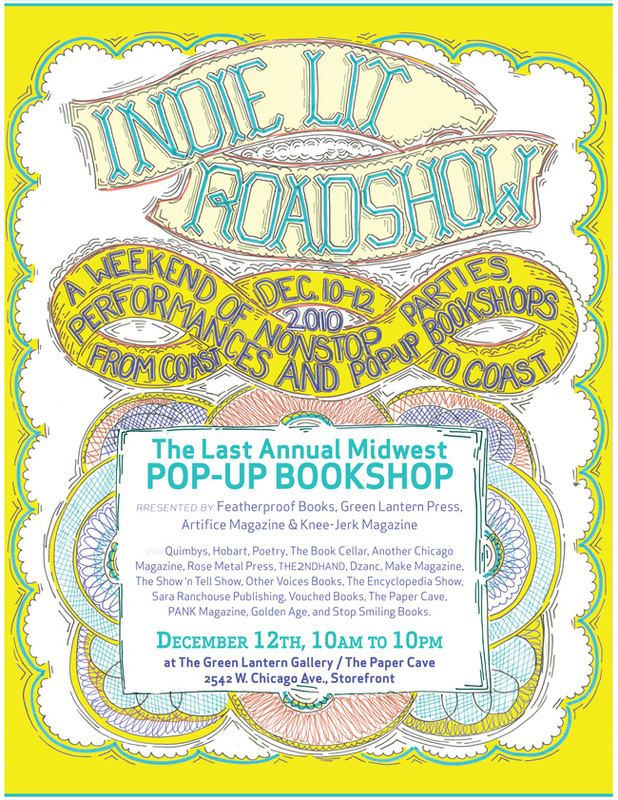 This will be your first and last chance to shop Chicago’s curatorial pop-up bookshop. In honor of the venture there will be a ribbon un-cutting, and Artifice Magazine’s papier-mâché cave, which the curious can crawl inside to hear some of the best in Chicago readings. You should be at at least one of these events. You should bring cash. You should buy sentences from me and others. Buy sentences for yourself. Buy sentences for other sentence lovers. Small press books are often small. You know where small things go this time of year? Stockings. That’s where. I wish I could get to this Chicago event. I’m going to have to sell my kidney or something. I’m still ironing out my schedule and such, but it might work out that if you can get to Indy early enough, you can ride up with me. Um. That would be awesome. Let me know if that could work out.